INTRODUCTION: Cyclic Mastalgia is defined as breast pain before the onset of menstruation. It may be experienced unilaterally or bilaterally and is often associated with tenderness. Pain usually subsides spontaneously but it re-occurs with subsequent menstrual cycles. METHODOLOGY: A total sample of 29 females were recruited for the study based on the inclusion and exclusion criteria. The outcome measures used were Visual Analogue Scale, RAND SF-36 questionnaire and Pressure Algometer. Pre intervention scores were recorded and an exercise programme was administered to the subjects, 3 times per week for 4 weeks. Post intervention outcome measures were recorded. RESULTS: The results proved that pain, tenderness and Quality Of Life improved significantly after the intervention with P value of (0.0001). Components of QOL like Physical functioning, Physical health, Emotional problems, Emotional well being, Social functioning, General health, Enegy levels improved after intervention. Determining the long term effects of the exercise programme was not a objective of the present study but we found that most of our study participants did not have recurrence of the symptoms of cyclic mastalgia for more than 3 months after the intervention. CONCLUSION: The Experimental study demonstrated that Structured Exercise Programme was effective in reducing pain, tenderness and improving Quality Of Life in adult females with cyclic mastalgia. Cyclic mastalgia is defined as breast pain before the onset of the menstruation and subsides with the onset of the menstrual cycle. The cyclic mastalgia symptoms can range from mild to severe and are typically experienced few days before the menstrual cycle. The pain may be experienced either unilaterally or bilaterally and is often associated with the tenderness. Mastalgia is classified into three categories according to the Cardiff Mastalgia Clinic as follows: (1) cyclic mastalgia (associated with the menstrual cycle): The pain is typically experienced during the luteal phase of menstrual cycle and it is often associated with the ovulatory phase of the menstrual cycle. The presentation of the symptoms can be different in individuals, and the quality of the pain is often reported to be as sharp, shooting, stabbing, heaviness, aching, and throbbing. The pain is accompanied by tenderness of the breasts to deep palpation; (2) noncyclic mastalgia (not associated with the menstrual cycle): This pain is independent of the menstruation, and it has no specific pattern in which the condition presents. Pain is not felt all over the breasts but is often well localized to a particular region of the breast. The pain is often bilateral, and quality of pain is reported to be heavy, aching, fearful, burning, pulling, stabbing, and pinching. The breasts are tender on palpation; and (3) chest wall pain: This pain has no association with the menstrual cycle, and it has no specific pattern. It can be seen in all age groups and can occur at any time of the age. The pain is often unilateral as in rib pain, muscular pain, operative injury, or referred pain. The exact etiology and mechanism of mastalgia are not well established, but according to few theories, cyclic mastalgia occurs due to the hormonal irregularities such as increased estrogen secretion from the ovaries, decreased levels of progesterone, and increased levels of prolactin., There are various studies conducted to determine the prevalence of the cyclic mastalgia and its impact on quality of life (QOL). There are studies where Yoga techniques, LASER, Kinesiology, and Primrose oil have been used in the treatment of cyclic mastalgia. There is dearth in literature where specific, structured physiotherapy treatment has been used in the management of cyclic mastalgia. Hence, the present study was conducted to determine the effect of structured exercise program on pain, tenderness, and QOL in adult females with cyclic mastalgia. Our research question is a well-structured exercise program proves to be effective in the treatment of cyclic mastalgia on pain and QOL in young adults? Female students presenting with cyclic mastalgia from Constituent Units of University were recruited for the study. The study type was an experimental study, and the study design was a single-group pre-post experimental study design. The target population was females aged 18–25 years with complaints of cyclic mastalgia. The duration of the study was 1 year (March 2017–February 2018). The sample size for the present study was 29. The sampling design used was nonprobability sampling, and sampling technique was convenience sampling. Female participants with the following were included in the study: (1) females with complaints of cyclic mastalgia, (2) age: 18–25 years, (3) females with regular menstrual cycle, (4) nulliparous females, and (5) willing to participate in the study. Females excluded from the study were (1) those with irregular menstrual cycle, (2) pain arising from the chest wall, (3) individuals on hormonal therapy, (4) on medications for mastalgia, (5) breast pain associated with the lump (noncyclical mastalgia), and (6) diagnosed cases of breast cancer or any other condition which is under investigation. The sample size comprised 29 participants. n = 2t (SD/d)2 (Z/1− α/2 − Z/1 – β)2. Approval for the study was obtained from the Institutional Ethical Committee (No: 115). Participants were recruited based on the inclusion and exclusion criteria. A written informed consent was obtained from the study participants. A total sample of 29 adult females was recruited for the study. The present study used the covariates such as age when attained menarche, cycles if regular or irregular, weight, height, and body mass index (BMI) [Table 1]. The visual analog scale (VAS) was administered to the participants to determine the intensity of the breast pain and was explained to them in their vernacular languages, and the VAS scores for the breasts were recorded [Table 2]. Breasts were assessed for tenderness using the pressure algometer and graded accordingly [Table 3]. The study participants with the VAS scores >4 were included in the study. The participants were explained the scale in their local language and in terms of mild, moderate, and severe according to the scale specifications. The participants in the present study were physiotherapist; hence, they were very well versed with the use of the scale. RAND SF-36 questionnaire was administered to the participants, and the preintervention scores were recorded [Table 4]. A structured exercise program was delivered to the participants three times per week for 4 consecutive weeks. Postintervention VAS scores, tenderness scores, and SF-36 scores were recorded accordingly. In the present study, the structured exercise program was designed based on a study which was conducted on nursing students with mastalgia. The students were given a yoga therapy for 12 weeks, including the set of exercises. This program proved to be effective in the treatment of cyclic mastalgia. The yoga study was used as a reference based on which physiotherapy exercises were structured in the present study. The participant was made to sit on a chair; the therapist stands behind the participant. The participant was asked to bend both the elbows to 90° and shoulder to 90°. The therapist places her hands at the end of the elbow and passively pulls the hand behind. This position is maintained for 30 s and repeated. Participants were in the standing position facing toward the wall with feet apart, the shoulder is flexed to 90°, and the palms are placed on the wall. The participants were asked to go forward toward the wall bending their elbows and come back. Participants were in the standing position, they were asked to stand with their feet slightly apart, and then ask the participant to perform trunk flexion, extension, lateral flexion to the right and left sides, and rotation to both the sides. Segmental breathing (bilateral coastal expansion): The participants were in a sitting position with their hands being placed on the lateral aspect of the lower ribs bilaterally. They were asked to breathe in through the nose and breathe out through the mouth. At the end of the expiration, ask the patient to apply the manual resistance to the lower ribs. To mobilize the upper chest and the shoulders: Participants were made to sit in a chair and perform a bilateral shoulder flexion of 180° with slight abduction while inspiration. This is followed by bending forward to reach the floor while exhaling. Cardio/respiratory exercises: Frequency: continuous session of 10 min; intensity: mild to moderate; and duration: 3 sessions/week. Statistical analysis for the present study was done using the Statistical Package for the Social Sciences version 17. For this purpose, the data were entered into an Excel spreadsheet, tabulated, and subjected to statistical analysis. This present study generated nominal data. Various statistical measures such as mean and standard deviation were used. 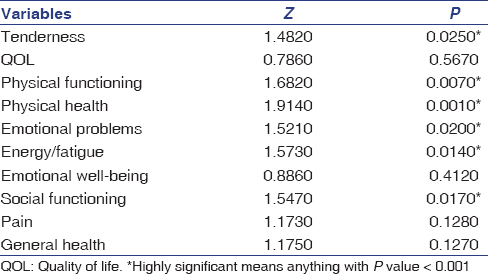 Normality of change scores from pretest to posttest of different variables was done using the Kolmogorov–Smirnov test [Table 5]. Comparison of the pre-post intervention outcome measures such as VAS, tenderness, and individual components of QOL was done by Wilcoxon matched-pairs test, and for overall QOL, paired t-test was used. Correlation between BMI and cyclic mastalgia was assessed in our study; the results support that there was no correlation between BMI and cyclic mastalgia [Table 6]. The present study assessed the pain scores for the breasts using a VAS at baseline and after the intervention. The mean VAS scores preintervention was 6.10 ± 1.26 mm and postintervention was 2.90 ± 1.24 mm, respectively. The breast tenderness scores were also assessed in the present study using the pressure algometer with preintervention tenderness score of 1.07 ± 0.84/kg and postintervention tenderness score of 2.41 ± 1.03/kg, respectively. The QOL was also assessed in our study using the RANDOMIZED SF-36 questionnaire, the results proved that the exercise program was effective in improving the QOL of the females with P = 0.0001* which is statistically highly significant. The present study aimed to determine the effect of a structured exercise program on pain, tenderness, and QOL in adult females with cyclic mastalgia. According to the results of our previous pilot study, the point prevalence of cyclic mastalgia in the adult females aged 18–25 years was estimated to be 30%. The present study assessed the pain scores for the breasts by using a VAS at baseline and after the intervention. The mean VAS scores preintervention was 6.10 ± 1.26 mm and postintervention was 2.90 ± 1.24 mm, respectively. In the present study, the exercise intervention proved to be effective in decreasing pain as the literature suggests that when regular physical activity or exercises are performed, it enhances the return of blood to the heart and improves the blood circulation to the entire body. Another reason is that when exercises are performed, it helps in the release of prostaglandins into the body which in turn reduces or prevents pain and the associated discomfort. This can be positively correlated to the present study in which we included the exercises focusing mainly on the upper body which might have enhanced the blood circulation and flow, especially to the pectoral muscles, retractors, trunk flexors, extensors, rotators, side flexors, etc. Another reason could be that exercises help in increasing the brain neurotransmitters of the body, especially the endorphins. The mechanism of the action of endorphin is that it resembles to be a body's own natural painkiller which helps in giving analgesic and pain relieving effect. Endorphins help in reducing a hormone named cortisol which is addressed as the stress hormone and is one of the determinants in the etiologic of the cyclic mastalgia. Due to this, the adrenal gland releases less amount of cortisol which reduces the pain. Literature suggests that when exercises are performed, they help in regulation of the hormones, especially estrogen and progesterone, which is one of the main cause of cyclic mastalgias and hence exercises help in regulating the hormonal imbalance and in turn help in reducing the breast pain. The breast tenderness scores were also assessed in the present study using the pressure algometer with preintervention tenderness score of 1.07 ± 0.84/kg and postintervention tenderness score of 2.41 ± 1.03/kg, respectively. The reduction in the breast tenderness may be due to the stretching of pectoral muscles which results in stretching of the muscle fibers and thus reduces the tender points which get generated due to pain. The QOL was also assessed in our study using the RANDOMIZED SF-36 questionnaire, the results proved that the exercise program was effective in improving the QOL of the females which is statistically highly significant [Graph 1]. 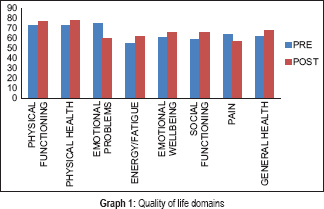 The QOL questionnaire consists of eight domains of physical fitness, in the present study, individual components such as physical functioning, physical health, emotional problems, energy/fatigue, emotional well-being, social functioning, pain scores, and general health were assessed and were found to be affected due to the cyclic mastalgia which significantly improved after the intervention was delivered. There exists a strong link between the exercise and the QOL variables. According to the literature, when the students enter the college life after their schooling, they undergo a transformation phase as adults, from schooling when they enter the college life they face lot of changes like change in the studying environment, pressure of excelling in studies and their work, they are exposed to competitive world, when students shift away from their home towns for studies they face problems like increased responsibility, hectic schedules. Studies suggest that when students undergo this transformation phase, they are at risk of having emotional disturbances, mental issues, and decreased physical fitness due to the lack of exercises. These factors can have an adverse impact on the QOL measures. Literature also exists that exercises or activities when performed have a positive effect on the QOL variables such as self-confidence and self-esteem. Similarly, in this study, we included the young adults aged 18–25 years who might also be undergoing the transformation phase as mentioned above. All the dimensions of QOL improved significantly after the intervention which proves that increase in the physical activity has beneficial effects on the QOL measures. Correlation between BMI and cyclic mastalgia was assessed in our study; the results support that there was no correlation between BMI and cyclic mastalgia. This can be positively correlated to a study conducted on young Indian females aged 18–29 years with complaints of cyclic mastalgia. The results support that the prevalence of cyclic mastalgia was found to be 88%. The study also stated that the participants with low BMI had a high risk of mastalgia compared to those with the normal BMI or high BMI. This is in contrast to our present study where the BMI of the participants ranged from normal to overweight and majority of the adult females had their BMI within the normal limits. This could be the possible reason why we did not find a correlation between BMI and mastalgia in our study. Determining the long-term effects of the exercise program was not an objective of the present study; however, we found that most of our study participants did not have reoccurrence of the symptoms of cyclic mastalgia for more than 3 months after the intervention. This shows that the intervention was effective in reducing the symptoms of mastalgia. Limitation of the study is that baseline physical activity of the study participants was not assessed. Correlation between breast size and cyclic mastalgia was not assessed in the study. Future scope with the strength of the study is that a structured physiotherapy protocol was framed for cyclic mastalgia, the study created a database regarding the prevalence of cyclic mastalgia, and it may be a risk factor for breast cancer; thus, it enlightened the females regarding the importance of mastalgia. The experimental study demonstrated that structured exercise program was effective in reducing pain, tenderness, and improving QOL in adult females with cyclic mastalgia. Results showed that various domains of QOL such as the physical functioning, physical health, energy levels, pain scores, social functioning, general health, emotional problems, and emotional well-being were affected as a result of cyclic mastalgia. Structured exercise program delivered for three sessions per week for 4 weeks proved to be effective in improving all the domains of the QOL. We also found that there was no significant correlation between the pain scores and cyclic mastalgia. Determining the long-term effects of the exercise program was not an objective of the present study; however, we found that most of our study participants did not have reoccurrence of the symptoms of cyclic mastalgia for more than 3 months after the intervention. The participants reported symptomatic and clinical improvement in the cyclic mastalgia. No separate data were collected regarding the follow-up. This statement is made on the symptomatic improvement by most of the patients. Rosolowich V, Saettler E, Szuck B; Breast Disease Committee. Mastalgia. J Obstet Gynaecol Can 2006;28:49-57. Sitruk-Ware R, Sterkers N, Mauvais-Jarvis P. Benign breast disease I: Hormonal investigation. Obstet Gynecol 1979;53:457-60. Peters F, Pickardt CR, Zimmermann G, Breckwoldt M. PRL, TSH, and thyroid hormones in benign breast diseases. J Mol Med 1981;59:403-7. Boonstra AM, Schiphorst Preuper HR, Balk GA, Stewart RE. Cut-off points for mild, moderate, and severe pain on the visual analogue scale for pain in patients with chronic musculoskeletal pain. Pain 2014;155:2545-50. Kinser AM, Sands WA, Stone MH. Reliability and validity of a pressure algometer. J Strength Cond Res 2009;23:312-4. Hays RD, Morales LS. The RAND-36 measure of health-related quality of life. Ann Med 2001;33:350-7. Raghunath S, Raghuram N, Ravi S, Ram NC, Ram A. Effect of yoga therapy on quality of life and depression in premenopausal nursing students with mastalgia: A randomized controlled trial with 6-month follow-up. J Health Res Rev 2016;3:48-54. Padang WS. The effect of anaerobic and aerobic exercise on endurance and non endurance athletes on premenstrual syndrome (PMS). IOP Conf. Series: Materials Science and Engineering 2017;180:012183. Stults-Kolehmainen MA, Sinha R. The effects of stress on physical activity and exercise. Sports Med 2014;44:81-121. Raghunath S, Raghuram N, Ravi S, Ram NC, Ram A. 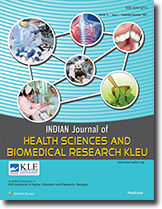 Prevalence of mastalgia in young Indian females. J Health Res Rev 2015;2:108-11.